Assemblyman William F. Boyland Jr. has run afoul of the authorities to an extent that is unusual even for the caldron of scandal that is New York’s capital. Assemblyman William F. Boyland Jr. In 2011, Mr. Boyland was arrested in Manhattan on federal bribery charges and then acquitted, only to be arrested weeks later in Brooklyn on separate federal bribery charges. The allegations did not drive Mr. Boyland from office. He fended off six challengers in his Brooklyn district to win a Democratic primary in September and won re-election in November with more than 90 percent of the vote. His second corruption trial is scheduled to begin in July. In November, the state comptroller instructed Mr. Boyland, 42, whose father and uncle both served in the Assembly, to repay the state $67,497 in travel reimbursements he had received by claiming to be in Albany on hundreds of days when, an investigation made public on Thursday charged, he was nowhere near the capital. He did not comply. So on Wednesday, the comptroller’s office informed Mr. Boyland that it would withhold his future travel reimbursements to make up for that amount. Mr. Boyland even sought reimbursements on three days when he was in federal court in New York City attending proceedings relating to corruption charges against him, the inquiry by the comptroller, Thomas P. DiNapoli, found. The comptroller’s office accused Mr. Boyland of falsely claiming to have been in Albany so that he could take advantage of the $165 per diem and mileage reimbursements that are provided to state lawmakers when they travel to the capital. To help ascertain Mr. Boyland’s whereabouts, investigators examined the electronic records of when Mr. Boyland’s state identification card was used at the Legislative Office Building and the parking garage at the Capitol complex, as well as his E-ZPass and bank records. Mr. DiNapoli said his office had discovered “a troubling pattern of abuse” by the assemblyman. Investigators concluded that on 609 of the 975 days that Mr. Boyland claimed to be in Albany from 2007 until early last year, the assemblyman was either someplace else or was not in the capital for as long as he claimed. In one instance in 2008, his debit card was used at Toys “R” Us and Circuit City in Brooklyn during a four-day stretch before Christmas in which he claimed to be in Albany. At other times, records showed that he was visiting faraway destinations, including his alma mater, Virginia State University, as well as Atlantic City, the Hamptons, Maryland and North Carolina. The results of the investigation were reported this week by The Times Union of Albany. The comptroller’s office said it had informed Mr. Boyland’s office of its findings in September; Mr. Boyland, through his lawyer, responded by saying that to avoid incriminating himself in future criminal proceedings, he would not provide any information. Mr. Boyland did not respond to a telephone message seeking comment on Thursday. 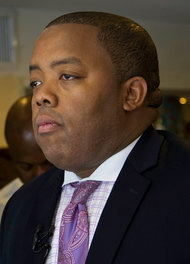 Questions about Mr. Boyland’s travel expenses were raised in 2011 by the political newspaper now known as City and State, which said that Mr. Boyland had claimed a per diem for being in Albany on the day he surrendered to face corruption charges in Manhattan, and that he had indicated in posts on Facebook that he was far from the capital on other days when he would later request travel reimbursements. The newspaper later reported that Mr. Boyland had claimed per diems on days when he was alleged by prosecutors to be soliciting bribes in New York City. The comptroller’s office conducted its inquiry at the request of the Albany County district attorney, P. David Soares. A spokeswoman for Mr. Soares said Thursday that his office was continuing to investigate Assemblyman Boyland. A version of this article appeared in print on February 8, 2013, on page A20 of the New York edition with the headline: Brooklyn Legislator to Lose $67,000 for False Travel Filings.